Big day today! I don’t know if any of you have noticed the countdown box in the sidebar, but today marks the beginning of another book giveaway. This time the book is a signed copy of Sir Bentley of Holbrook Court. I hope you’ll take the time to read the review and leave a comment. Leaving a comment will automatically enter you in the drawing for the book*. The winner will be announced in a week on Thursday, November 22. Bentley mounted Silverwood, look down at his parents, and launched the powerful steed into the kingdom…a kingdom waiting for one young knight to discover the truth of a Stranger. When Bentley refuses to kill two Followers, his fate is sealed. His days as a Noble night have ended. Now he must leave Chessington in search of the Truth. He learns that the man called The Stranger was, and is, the Prince. The Son of the True King. In his pursuit to follow in the footsteps of his Prince, Bentley becomes a peasant and ventures into Holbrook. He becomes one of the farmers and discovers oppression, injustice, love and a cause to fight for. The day is coming when Holbrook will need a knight of the Prince. This may well be my favorite book in the Knights of Arrethtrae series. Bentley’s quest for Truth and desire to serve the Prince illuminate truths about God and our responsibilities as Christians. A paragraph from the back cover of the book sums up the reason I love this series so much. “Journey to Arrethtrae, where these knights of noble heart live and die in loyal service to the King and the Prince. These knights are mighty, for they serve a mighty King.” I think that we, as Christians today, often forget to walk in the truth that we are in a battle and should and can fight that battle as mighty warriors, for we serve a mighty King. Never forget, the King reigns…and His Son! Come back on Wednesday for an author interview with Chuck Black! What do you like about the Kingdom Series or the Knights of Arrathtrae Series? 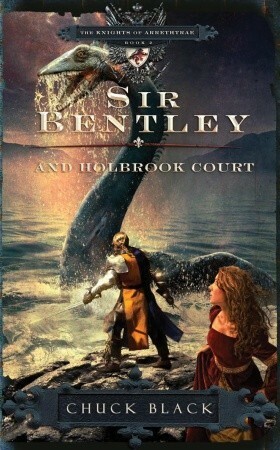 Why would you like to win a copy of Sir Bentley and Holbrook Court? *Due to cost of shipping, this book cannot be mailed outside of the continental United States. I think this book would make an excellent Christmas present… 🙂 I was already thinking of getting the first book in the Kingdom Series for Jack; these books seem like a great investment to me. Ooo… I love fantastical literature! Ooh! We wantss it, precious! Noooo! It’s ours, precious, it’s ours! You’re welcome. The whole series is fantastic. Even if you don’t win the giveaway, I definitely recommend reading them. HA! Leah, I think we found out how to get people to post on your blog: offer free stuff! Yes, my preciousss, we likes the LOTR referencesss. Hmm, what’s this book got in its chaptersesss? Is it scrumptious, is it delightful, preciousss?